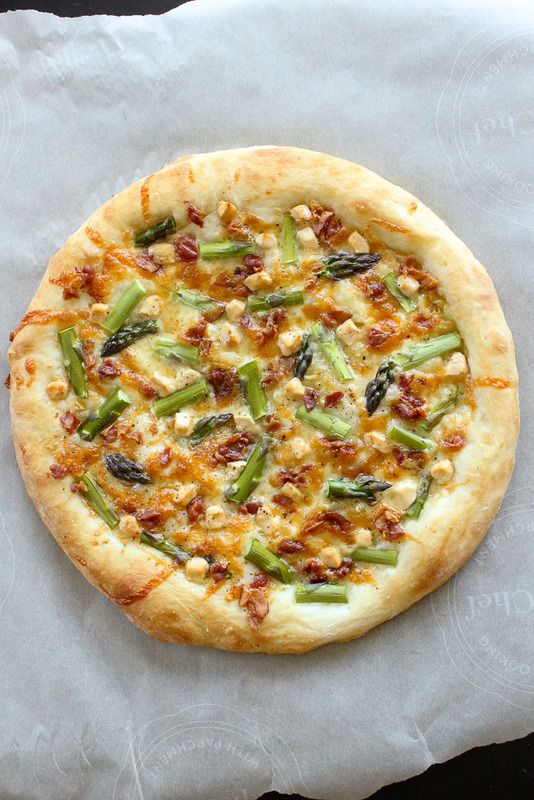 This Asparagus Bacon Goat Cheese Pizza is easy to make and perfect for spring. 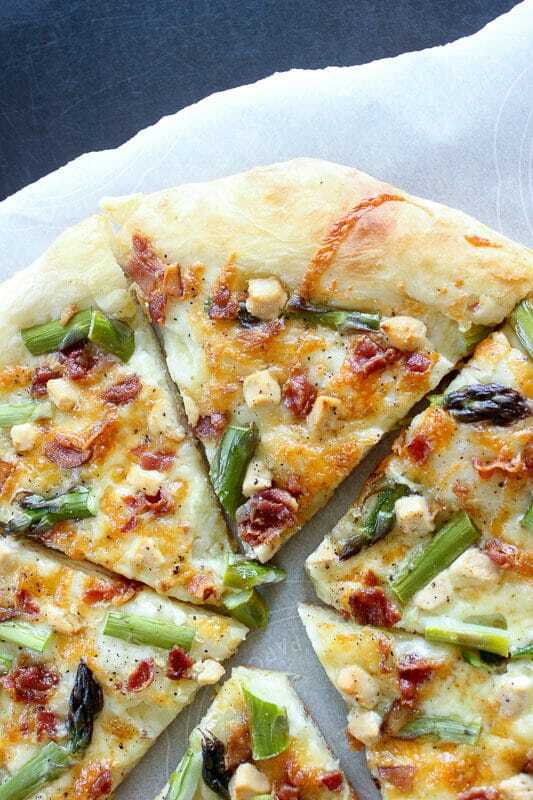 Fresh asparagus, smoky bacon, salty goat cheese and a garlic sauce make every bite of this pizza a fantastic spring treat. Asparagus, to me, is the ultimate spring food. It’s not a cheap vegetable, but if you want to enjoy those delicate green spears at any time of year, they’re cheapest now. 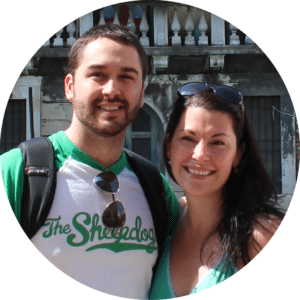 Watch for sales – they happen pretty regularly. Better yet, if you have even a tiny patch of land, you can plant your own. Planting asparagus is a bit of a long-term game. From the time you plant the crowns you have to wait until they’re in their third year to start to eat them. But once they’re mature enough, they’re a dream. Asparagus is a perennial plant, which means it comes back automatically every year. After an initial investment of time and energy (and a bit of money) to plant the crowns, you just need to do a bit of caretaking each year, and you can be eating the most delicious asparagus ever, until it comes out your ears (for free!). Fortunately for us, my dad had the foresight to plant a bed of asparagus years ago and we wait, practically with bated breath, for it to start growing each spring. Then we feast on asparagus for about a month until it dies back again. It’s the ultimate in seasonal eating. 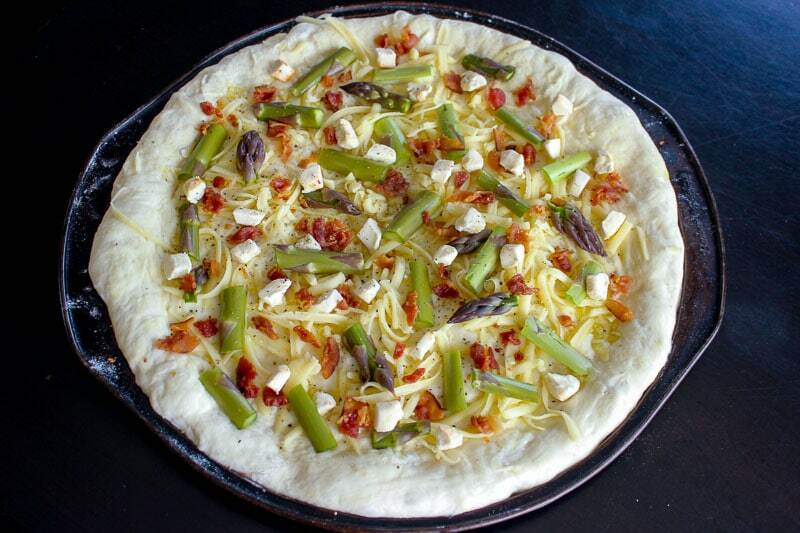 This pizza is one of the many asparagus preparations that will cross our table over the next few weeks, and it’s the perfect spring treat. Make it even easier by making your pizza dough in advance and freezing it in balls (we used our Simple Pizza Dough recipe). Look for goat cheese on sale (I got this one for half price. Yes, it’s chipotle flavour. I just went for it and it was still delicious) or at Costco – it freezes well (details in this post). Bacon is easy to pick up on sale and stash in the fridge or freezer. 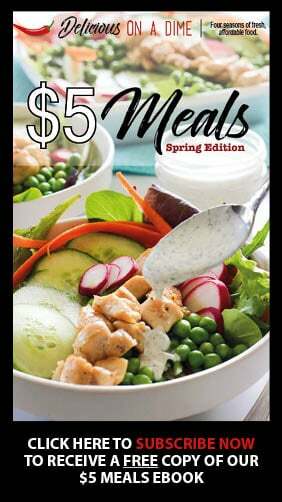 And asparagus, in the spring is nicely affordable. Since this recipe doesn’t use much, it’s the perfect way to use leftover asparagus from another bundle! Step-by-step photo instructions are below the recipe. Grease pizza pans (this recipe makes enough for two 12-inch pizzas or one long cookie sheet pizza). Press dough into pans. In a small bowl, mix 5 cloves of minced garlic with 2 tablespoons of olive oil. Spoon garlic oil over the doughs and spread it around. Sprinkle grated cheese over garlic oil. 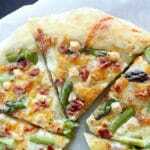 Top each pizza with chopped asparagus, cooked and crumbled bacon and small pieces of goat cheese. Sprinkle with freshly cracked pepper. Bake for around 15 minutes, until bottom of dough is browned. If you're making two pizzas, rotate them half way so they each spend time on the lower rack. Enjoy! 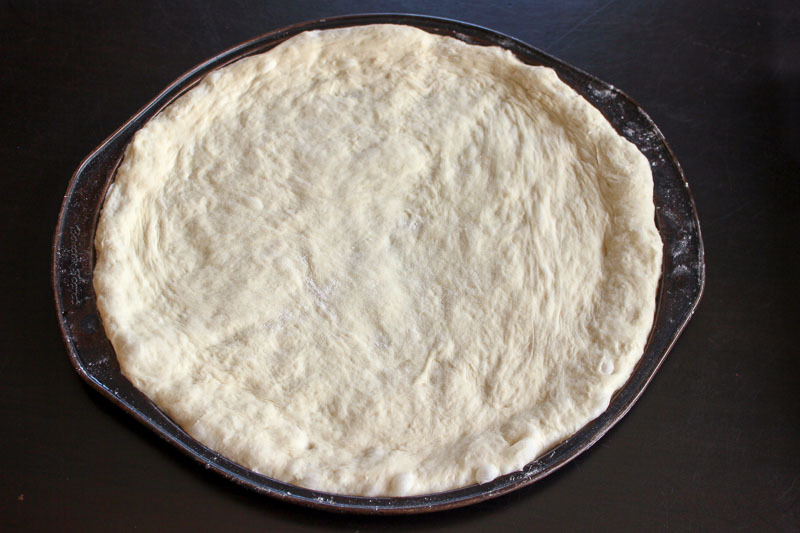 ** Check out our Simple Pizza Dough recipe for two easy ways to make homemade dough. Preheat oven to 450 degrees F. Make dough according to recipe directions (I used our Simple Pizza Dough recipe and it worked out really well). Grease pizza pans (this recipe makes enough for two 12-inch pizzas or one long cookie sheet pizza). Press dough into pans. 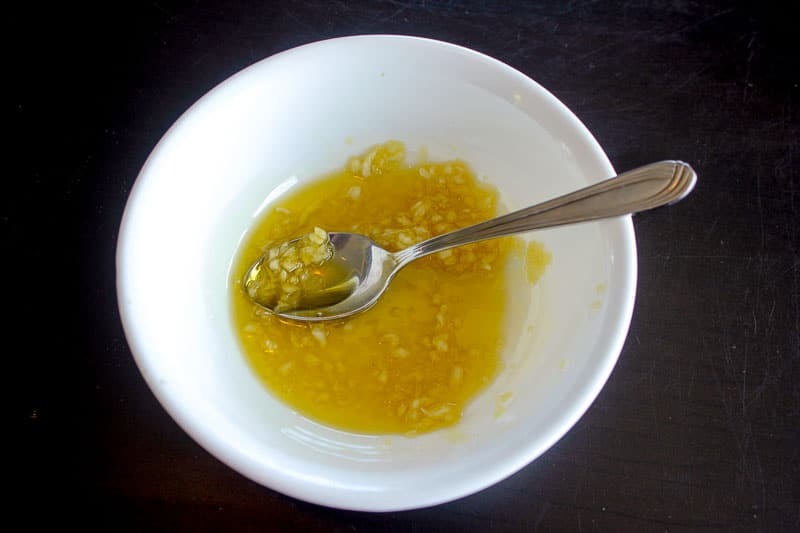 In a small bowl, mix 5 cloves of minced garlic with 2 tablespoons of olive oil. Spoon it over the doughs and spread it out. 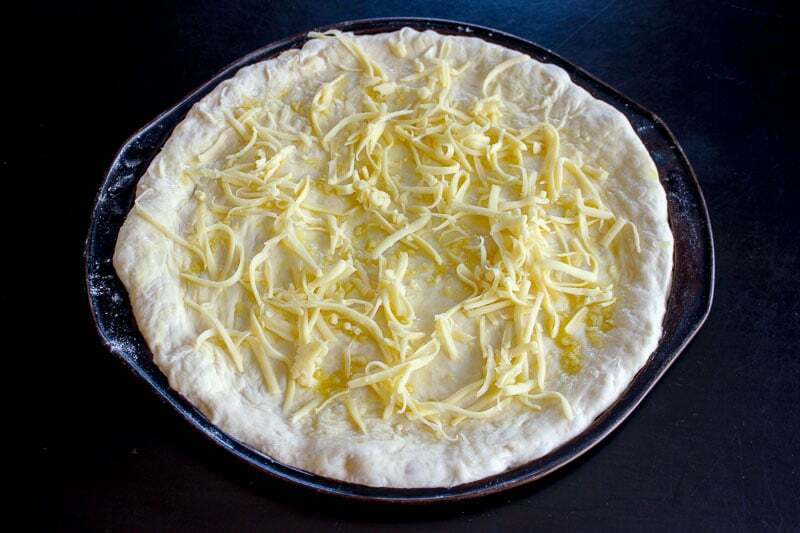 Grate around 1 cup of mozzarella cheese. 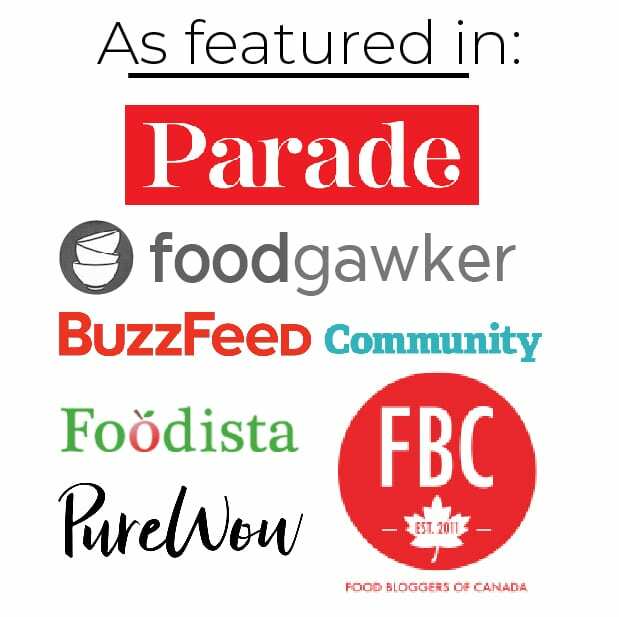 Sprinkle over doughs (only one is shown). 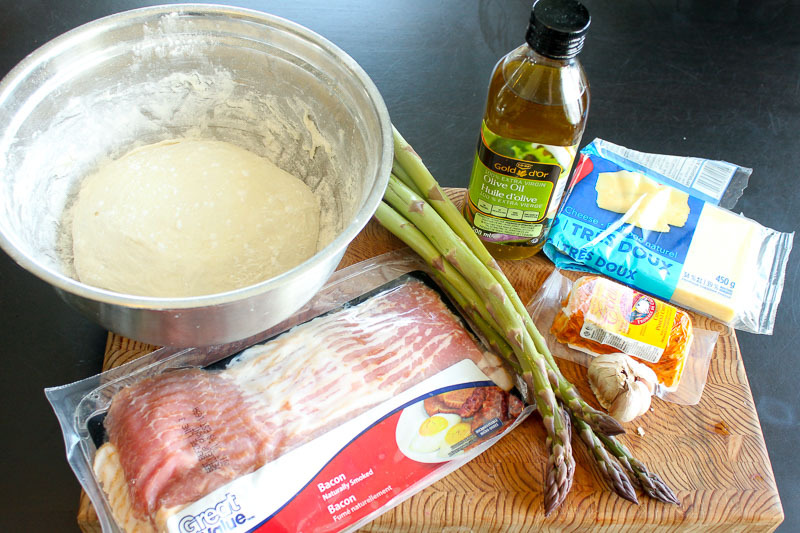 Top each pizza with 2-3 spears of chopped asparagus (if spears are thick, slice them down the middle so they cook faster), 1/4 package of cooked and crumbled bacon (so the recipe uses 1/2 package in total) and 1/4 roll of goat cheese, cut into small pieces (whole recipe uses 1/2 roll of goat cheese). Sprinkle with freshly cracked pepper. Bake for around 15 minutes, until bottom of dough is browned. If you’re making two pizzas, rotate them half way so they each spend time on the lower rack. What’s your favourite way to eat asparagus? Let me know in the comment section below!